And that is nasty. No one in the 100 Acre Woods ever poops. Just doesn't happen. Not even once did Piglet let so much as a fart come out. Knowing that you could step in Tigger poop would freak me out and remove all enjoyment from the characters. And whoever did it will probably get sued by Disney, those litigious bastards. This time I am with the evil legal minions of the mouse. 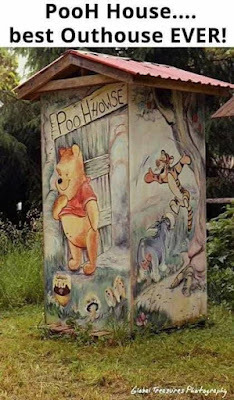 This kind of Pooh related potty humor has to be stopped. Everybody poops. But not Pooh.